​For Racing Aeolus 2018, the team relied on its triumphant 2017 platform, improving both mechanical and electronic systems. Indeed, at the mechanical level, the team was able to design a new turret lighter and to improve the aerodynamic profiles of the rear bodies. 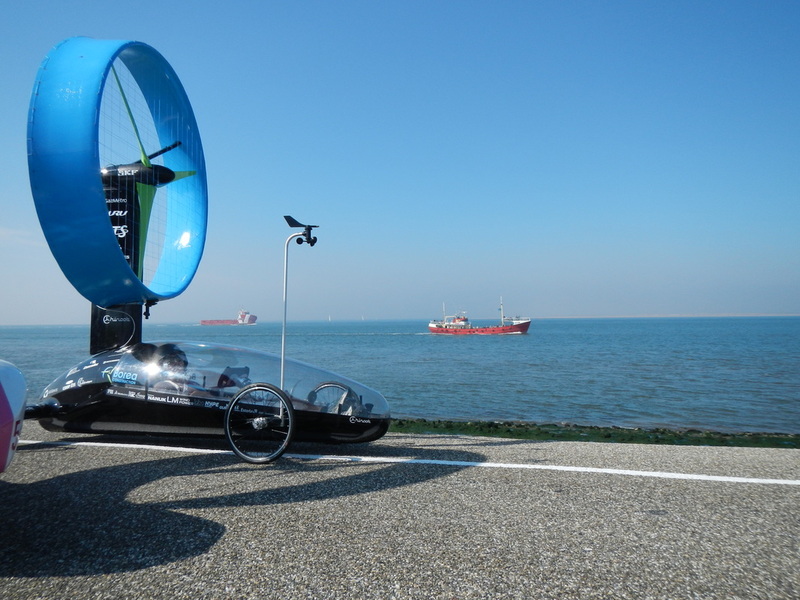 A new, lighter, one-piece carbon mast made us redesign the support structure of the wind turbine and its connection to the rest of the vehicle. Also, a lighter and more compact rotor was developed allowing once again the improvement of aerodynamic profiles. Finally, it was another 15 kg that were cut off from the vehicle. At the electronic level, the team developed a new data acquisition system based on the technology developed by SensTel. This new way of acquiring and processing data allowed the team to develop a machine learning system to get the most power out of the vehicle at any given moment. In addition, a new ultrasonic telemetry system was implemented at the vehicle, providing more accurate data on the direction and power of the wind at all times. With these new improvements, the team of Chinook ÉTS obtained, for a second year in a row, the first place in the general classification. In addition, the team came out with a new track record with an efficiency of 113.97%, a first place in the drag race, a second place in endurance and finally a third position in innovation. For Racing Aeolus 2017, the chinook team had to return to the drawing boards. The team arrived to the Netherlands with a 90% new car and was determined to break the world record with its new design. 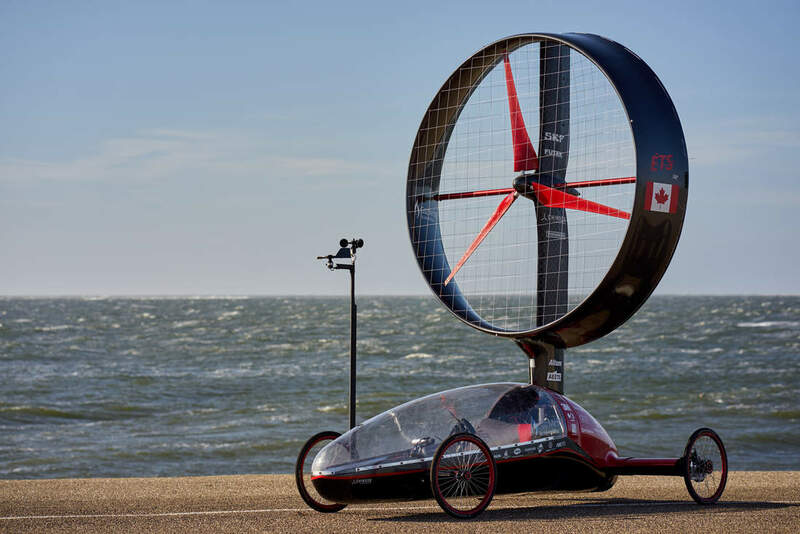 A new, more aerodynamic carbon fiber chassis, a new, better-performing transmission, a new lighter turret and a raised wind turbine were built by the team in order to have a better airflow. In total, the team have increase the aerodynamics of the vehicle by 2 times, and subtract 15kg from it. With Chinook 7, the ÉTS team won all the honors. ​Chinook 7 won the first place in the overall standings, the fastest race with an efficiency of 102.45% (new world record), the best average efficiency of the competition with 98% and the price of the Gerald Boers. Racing Aeous 2016 marked the last year of the chassis developed in the chinook 2 era. For this edition, the Chinook had two main improvements: the addition of new blades for weak winds and an electronically assisted aft direction. 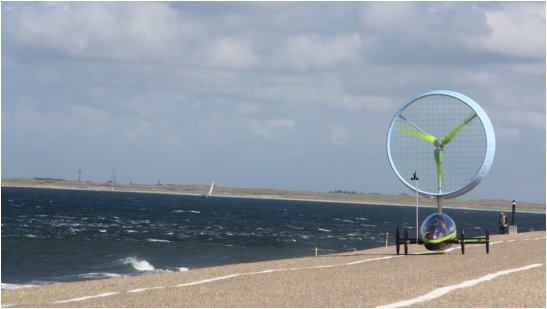 The new blades being complementary to those for high winds, allowed the vehicle to derive maximum wind energy for a wider range of wind speeds. The rear steering allowed the car to reduce its aerodynamic drag by steering the entire body against the wind. ​Chinook 6 finished in fifth position in the general classification due to an incident with one of our luggage containing critical parts of the vehicle. Nevertheless, the team had the second fastest race with an efficiency of 92.6% and won the Gerald Boers Award for Innovation Award. To prepare for Racing Aeolus 2015, the team used the knowledge aquired with Chinook 4 and optimised every aspect of the vehicule. The mechanical systems were improved to perform better in high wind conditions to reach the 100% mark. All electronic systems were reviewed, simplified and made more efficient. From there, the Chinook Black Box 2.0 was born. Instead of separate PCBs connected to each other through a complex cables network, everything was now mounted on a backplane board responsible to manage connection and supply power to every card. With Chinook 5, the team came back to Montreal with the drag race event cup and the fastest race. Unfortunately, due to bad wind condition on the first race day, the team won second place in the overall ranking. For Racing Aeolus 2014, Chinook team was aiming to design and build a more robust and optimized prototype based on Chinook 2 and 3 platform. A new carbon fiber frame and structural mast have been designed to save weight and add rigidity to the structure. The mast rotation system and the blade pitch were automated to simplify the pilot's task. Also, the telemetry system developped by the electrical team now allows real time monitoring of every parameter of the vehicule. 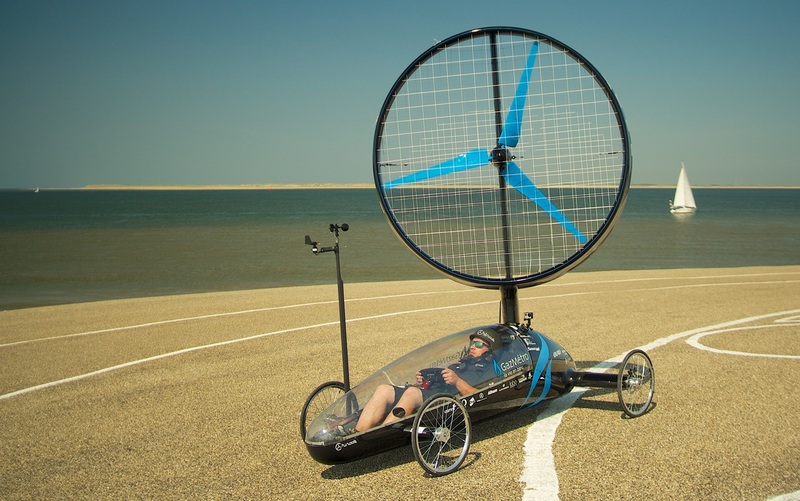 With this prototype, the team won every honnor: First place in global ranking, the Gerard Broers innovation prize and the fastest race allowing the team to establish a new world record of efficiency with a ratio of 96.91% of the wind speed. In racing Aeolus 2013, the car featured an all new transmission system without chains and based on a rolhoff hub. 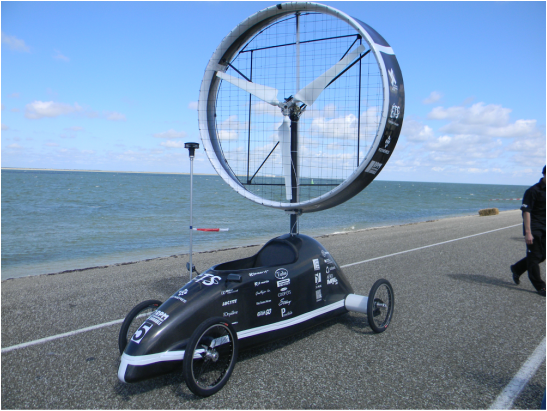 The aerodynamics of the mast were reviewed to improve the performance of the windturbine. The rotor now has a variable pitch system controlled by the pilot. In 2013, the team had a major break in the transmission and was disqualified because it did not complete enough races. However, Chinook 3 established a new world record of efficiency with a ratio of 82.6% of the wind speed. 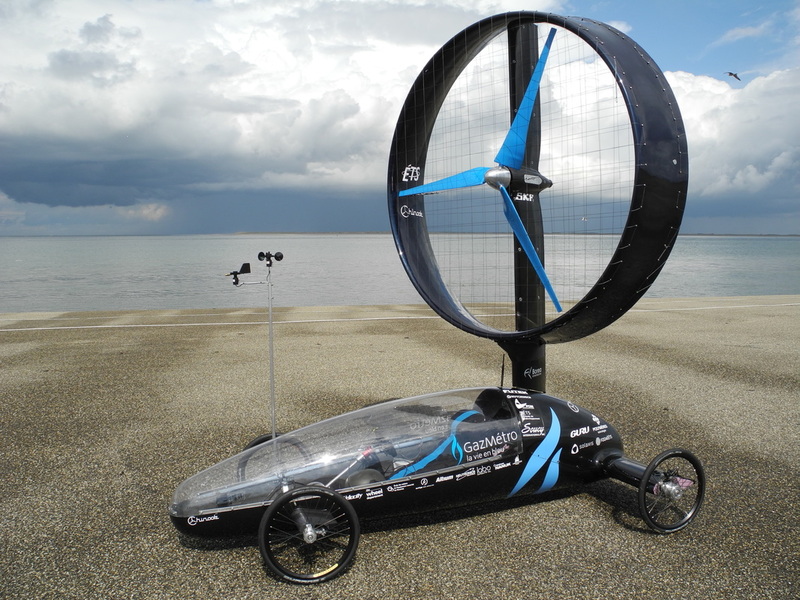 For Racing Aeolus 2012, an all new vehicule was developped with a more aerodynamic body carbon fiber body with a steel structure for the windturbine and a new transmission. this platform is still used on the current prototype. With this prototype, the team won the first place in overall ranking. Thid first prototype was developped between 2009 to 2011. The frame was made of a steel tubular structure covered by aerodynamic carbon skins. At its first appearence in Racing Aeolus, the team manage to won the second place of the competition.